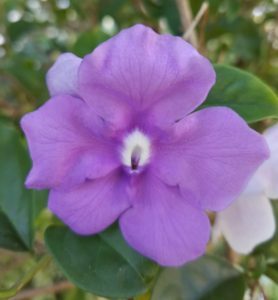 Yesterday, today and tomorrow in full purple soon after blooming at the Edison and Ford Winter Estates in Ft. Myers, Florida. 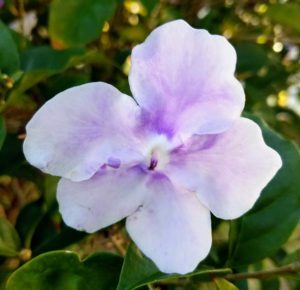 Yesterday, today and tomorrow bloom fading from purple to lavender at the Edison and Ford Winter Estates in Ft. Myers, Florida. Yesterday, today and tomorrow fading from lavender to white at the Edison and Ford Winter Estates in Ft. Myers, Florida. 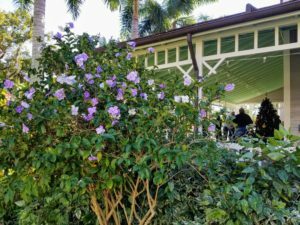 Yesterday, today and tomorrow blooming off the Guest Home porch at the Edison and Ford Winter Estates in Ft. Myers, Florida. 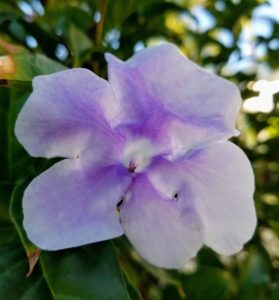 Not many flowers are able to change their petal color, but the yesterday, today and tomorrow (YTT), Brunfelsia grandiflora, is very good at it. This popular shrub starts out with purple blooms, which fade to lavender and then white before falling off. It can handle some cold, as low as Zone 9 in Florida, but it may lose it’s leaves until warmer weather returns. YTT may bloom anytime but it seems to be at it’s showiest as soon as our long, hot summer days end and the cooler fall weather returns. It prefers partial sun but can take full sun with sufficient irrigation. Otherwise, water it occasionally during the dry season. The YTT takes to shaping and can even be grown in containers. Come by the Estates and see the plants in action – we have a couple large shrubs between the Edison and Guest homes along the porches. If you want one for your landscape, drop by our Garden Shoppe and take one home. 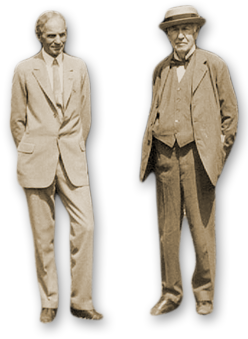 For more information on how to grow YTT, check out this previous post.